Jam Free, Hassle Free, Mess Free! 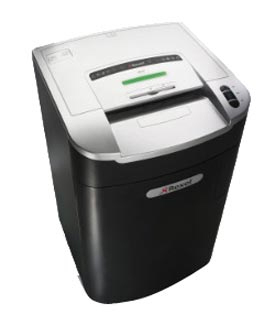 Made for the large office with over 20 users with high routine throughput, this Mercury shredder provides everyday security via effective 5.8mm strip cutting. It features Jam-Free technology with continuous sensing, takes 32 sheets at a time and fits up to 950 shredded sheets in recyclable bags enclosed in a pull-out frame for easy emptying. Strip cut P-2 security level.